(VOVWORLD) - Prime Minister Nguyen Xuan Phuc reaffirmed the policy of mechanizing, industrializing, and modernizing Vietnam’s agriculture. 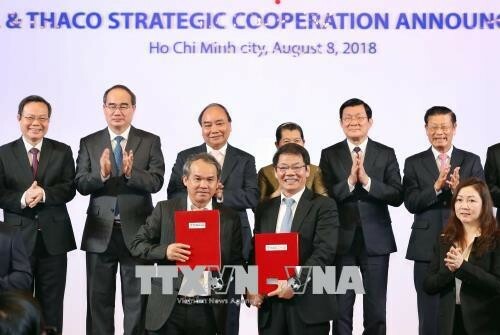 At a ceremony in Ho Chi Minh City on Wednesday to announce a strategic cooperation between the Hoang Anh Gia Lai (HAGL) Agricultural Joint Stock Company and the Truong Hai Automobile JSC (THACO), Mr. Phuc praised the cooperation between the two businesses, who always aspire to work together to contribute to the agricultural and industrial sectors in Vietnam, Laos, and Cambodia. PM Phuc said he believes the agreement will realize the dream of modernization shared by the agriculture sectors of the 3 countries. He said he hopes the agreement will be a model for the application of technology in agriculture and encourage big businesses to invest in agricultural development.